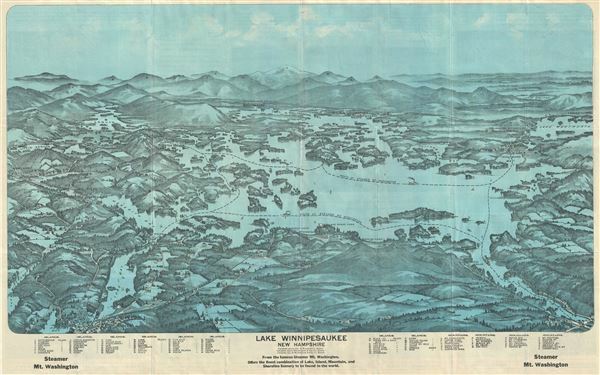 This is a beautiful 1903 bird's eye view style pocket map of Lake Winnipesaukee, New Hampshire by the Geo. H. Walker and Company, Boston. One of the more obscure and rare maps by George Walker, it covers the popular summertime destination from Little Asquam and Lake Winnesquam to Lake Wentworth and from Alton Bay and Round Bay to Moultonboro and Walkers Pond. Includes many New Hampshire Islands, towns and bays, including Center Harbor, Asquam, Moultonboro, Wolfboro, Lake Wentworth, Lake Ossipee, Long bay, Meredith Bay, Alton Bay, Round Bay and several others. The White Mountains are shown in the background, centered on a snow covered Mt. Washington. The foreground features houses and fields with sailboats and steamships in the water. Fifty-nine Islands and 26 mountains are key and listed along the bottom margin. The map also shows major railway lines. This map was published by the Geo. H. Walker and Co., 221 High St., Boston, MA. Very good. Minor creasing along original fold lines.